Modular components combine design flexibility with durable construction. Commercial-grade worksurface and side panels. 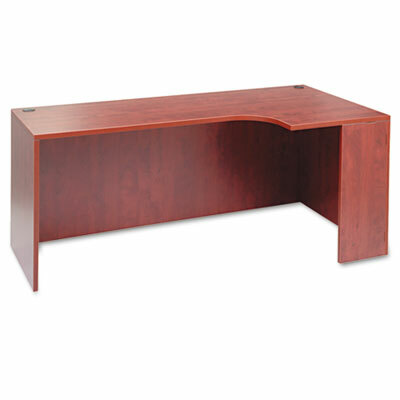 For use with Return to create an “L” Workstation, or with Bridge (ALEVA244824MY) and Desk Shell (ALEVA277236MY), both sold separately, to create a “U” Workstation. Can be combined with Pedestal (ALEVA552222MY), Lateral File or Storage Cabinet (ALEVA267212MY), all sold separately. Finish has a charcoal accent line under worksurface. Modular components combine design flexibility with durable construction. Commercial-grade 1" thick worksurface and side panels feature 3 mm PVC protective edge banding and are water-, scratch- and dent-resistant. Not freestanding. For use with Return to create an “L” Workstation, or with Bridge (ALEVA244824MY) and Desk Shell (ALEVA277236MY), both sold separately, to create a “U” Workstation. Can be combined with Pedestal (ALEVA552222MY), Lateral File or Storage Cabinet (ALEVA267212MY), all sold separately. Two wire management grommets. Full-length modesty panel. Finish has a charcoal accent line under worksurface. 72w x 36d x 29-1/2h.